Assembly Member Deborah Glick has never bothered to support congestion pricing, despite the huge burden that motor vehicle traffic imposes on her constituents in downtown Manhattan. As recently as last week, she told the Daily News she was still undecided. Glick’s indecision has real consequences. While Governor Cuomo deserves most of the blame for backing off his Fix NYC panel’s congestion pricing recommendations this budget season, the lack of any strong pressure from Glick and other NYC Democrats in the Assembly was also a major cause of Albany inaction. Over the weekend, Glick, along with every single Assembly Democrat, voted for a state budget that imposes a set of fees on taxi and Uber trips in the Manhattan core. A disproportionate share of the cost will fall on Manhattan residents, but it won’t provide the traffic reduction benefits of a real congestion pricing system. Glick’s constituents lost. If the three men in a room had been weighing a package that was similarly unbalanced toward Eastern Queens, David Weprin and his contingent in Albany would have kicked and shouted and made headlines. Manhattan reps in the Assembly did no such thing. 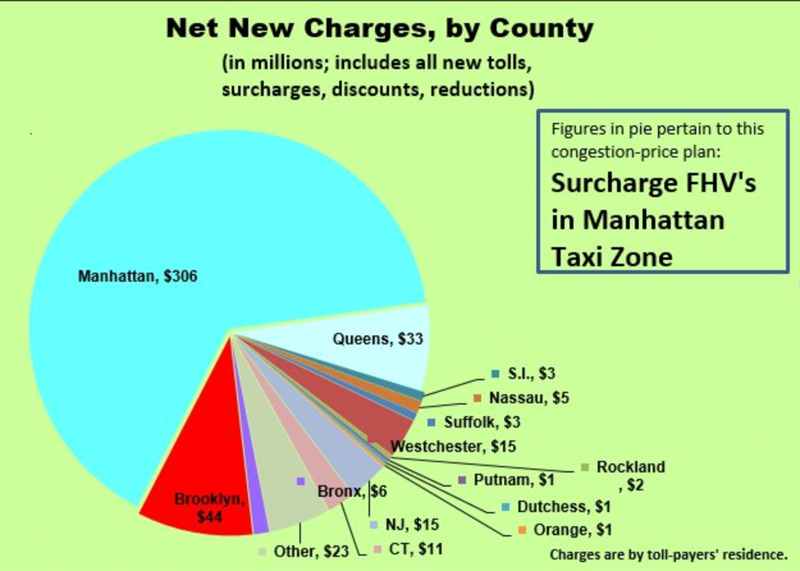 Streetsblog has been checking up with these representatives to get their take on the taxi fee and the absence of congestion pricing in the state budget. Glick is blaming her inaction on Mayor de Blasio. As with all budget bills, you can’t vote on just one provision – it’s all or nothing. Not voting for the transportation budget bill would have meant not voting for all of the funding, including existing MTA and DOT funds. I am pleased we have added a surcharge on for-hires as there has been a small one on yellow cabs for some time, and that these funds will go to mass transit. People can avoid the surcharge by taking mass transit as I do. Many people other than local residents use for-hire vehicles in Manhattan, such as business travelers. I do wish that we addressed congestion more comprehensively. First, I would prefer a cap on for-hire vehicles to reduce congestion. Second, I would support tolls on East River bridges, but the Mayor has rejected that proposal. After the first paragraph, it’s hard to make sense of this response. Glick doesn’t directly engage with the Fix NYC panel’s cordon toll recommendations, and she mostly conveys how little time and effort some Albany legislators put into understanding transportation policy. The deflection and finger-pointing at de Blasio doesn’t hold up either. The state legislature has proven itself to be very capable of overriding the mayor when politically suitable. And contrary to Glick’s assertion, the mayor has recently warmed to the Fix NYC proposal. Testifying in Albany in February, de Blasio sounded ready to make a deal. And since then, Transportation Commissioner Polly Trottenberg has said the city is prepared to enact any pricing plan Albany passes. A thorough review of the material should have produced a more informed response from Glick. Instead, like Denny Farrell and other Albany congestion pricing obstructionists 10 years ago, Glick hasn’t bothered to grasp what’s at stake, how it would work, and why it matters to her district. Her lack of support for non-drivers never ceases to amaze me, and I’ve been living in her district for years. I still can’t forgive her for fighting, and fighting, and fighting against the Hudson River Park. I’m sensitive to Streetsblog’s 501(c)3 status, hence, it being circumspect about partisan content. That said, considering its mission to “… reduce dependence on private automobiles and improve conditions for walking, biking, and transit” I don’t think it’s overstepping boundaries to remind readers that Deborah Glick is also on record opposing the proposed street modifications to accommodate the L train suspension of Manhattan service. I’m one of Glick’s constituents. I’m unaware of any primary challengers, credible or otherwise. This isn’t good news. 10 years ago after Deborah Glick had a role in taking the air out of the original congestion pricing balloon, I was approached with the proposition that should I mount a campaign against her, there would be a support network ready to go. Now, 10 years later, she claims to wish for a way to address for the twin plagues in her district: the overwhelming congestion and the deaths and injuries that cars bring to her constituents, and the continuing collapse of our transit infrastructure. But when literally handed a solution she fails to even weakly voice support. This is not leadership. It’s wimping out. There are many issues on which I think Glick has been a worthy champion, particularly in education, but her now repeated failings on this existential crisis to the city and her constituents is really a shameful black eye. Her district, which has some of the lowest rates of car ownership and the densest transit network IN THE COUNTRY, almost totally overlaps that of Sen. Brad Hoylman. Brad has established himself as a true champion of his constituents at the sidewalk level and of all of us who depend on transit; Deborah, just follow Brad’s lead, please! These problems won’t fix themselves if our leaders keep letting us down.